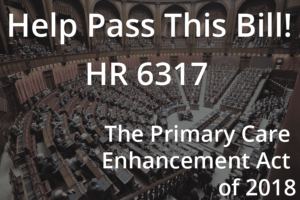 Primary Care Enhancement Act – Help Get This Bill Passed! Direct Primary Care (DPC) is the term that is used for the type of clinic we operate… rather than pay for each visit we make to the doctor, plus all of the materials, procedures, etc. that are done in the office, we include as much as legally possible in one flat membership fee. As the law stands now, our membership fee is not considered a medical expense. This means that you are not allowed to claim our membership fee as a medical expense on your taxes, nor are you allowed to use funds out of a Health Savings Account (HSA) to pay for our membership. In fact, if you have a membership with our clinic, you are technically disqualified from contributing to an HSA account. The House of Representatives will soon be voting on a large bill containing 2 important points of clarification for patients using DPC. First, it will include DPC membership in the IRS list of qualified medical expenses (so you can write off your monthly membership fees as a medical expense on your taxes). Second, it will allow employees to pay our membership with a Health Savings Account (HSA). Will you, THIS WEEKEND, call or email at least one, if not more of our state representatives, letting them know you support the Primary Care Enhancement Act of 2018 and why? I am a patient of a Direct Primary Care clinic in Yakima, WA. I have received this kind of care for ___ years. I think that all Americans should have the opportunity to receive care like this. PLEASE support the language from HR 6317 (The Primary Care Enhancement Act of 2018) and help pass this legislation. If more people in our country had access to primary care like this, our health system would be in a much better place than it is currently.